Taking the Badal stronghold of Lambi by storm, AICC vice president Rahul Gandhi on Thursday announced a time-bound agenda for the implementation of the Congress manifesto under Captain Amarinder Singh’s leadership, promising land for the Dalits and poor within two months, and jobs to the unemployed poor within three months of the formation of the Congress government.Addressing a massive public rally here at a packed Mansingh Stadium here, Rahul drew the curtain on the Congress campaign in Punjab, which votes for change on Saturday, with a vow to revive the devastated industry within three months, besides elimination of chitta (drugs) within a month of taking over the reins of the state.The AICC vice president announced a new law, with confiscation of properties of the drug dealers and the corrupt, to deal with the drug menace, which had destroyed a whole generation of youth in Punjab.Expressing serious concern at the spread of cancer and other critical diseases in the region due to unchecked pollution and fake pesticides, Rahul Gandhi promised a new legislation to provide free medical treatment for the victims of all diseases in the state, besides establishment of a world-class cancer institute for the treatment and cure of the afflicted. Recalling the Guru Nanak’s ethos of `sab tera’, which was ingrained in Punjabis and which Sukhbir Badal had transformed to `sab mera’, Rahul reiterated his commitment to revive the true spirit of Punjabiyat, with communal harmony and peace prevailing in the state. 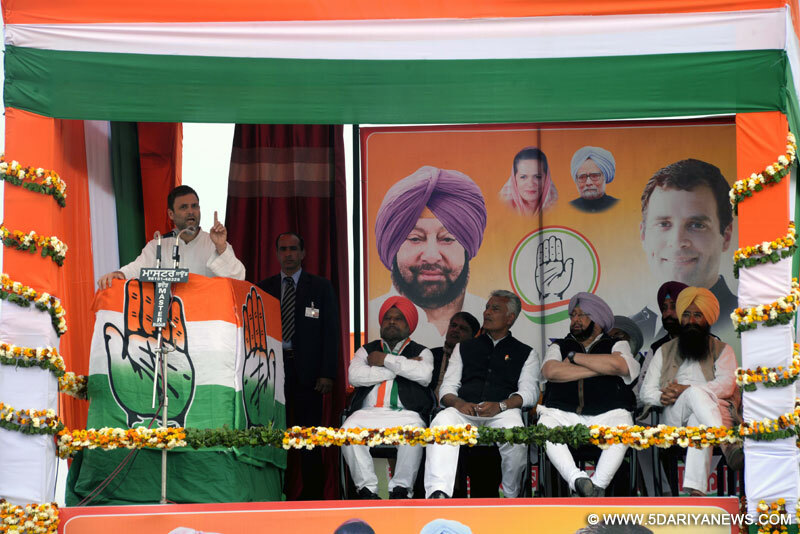 While the Congress chief ministerial candidate, Captain Amarinder, who is pitted against Parkash Singh Badal from Lambi, will work in Punjab, Rahul said he himself would take up vital issues of the state’s interest in the Lok Sabha.Rahul warned the people, who had seen the Badals destroy their lives for 10 years with their mafias and corruption, against allowing the state to go from one `kattarpanti’ (radical) thought to another by moving from the Akalis to AAP. Extremist forces are again trying to raise their head in Punjab and AAP leader Arvind Kejriwal is helping them, said Rahul, referring to the Maur bomb blast, which had been linked to KCF, and which occurred just a couple of days after Kejriwal stayed at a KCF commando’s house. Captain Amarinder, in his address, came down heavily on the Badals and Kejriwal for pushing Punjab into a quagmire of violence and unrest. While Kejriwal was encouraging the revival of extremism with his radical ideology, the Badals were selling (exploiting) religion for political gains, just as they had done in Patiala back in 1970. Asserting that he was sure Parkash Singh Badal would be found complicit in the Bargari sacrilege incident following a fresh probe into it, Captain Amarinder vowed to throw him into jail.Terming these polls as a vote for the future of Punjab and their children, he called upon the people to show the Badals and Kejriwal that their radical and divisive politics was not acceptable to Punjabis, who, having suffered severe tragic losses due to extremism earlier, wanted to live in peace and harmony.The PPCC president appealed to the people of Lambi to support him in teaching the chief minister the lesson of his life, along with a lesson to all future chief ministers not to play with the sentiments and lives of the people through their mafias and communal polarization. He expressed the confidence that the Akali leaders would get a thorough beating even in Jalalabad and Majitha, where Sukhbir Badal and Bikram Singh Majithia respectively were fighting to save their political careers.Captain Amarinder asked the crowd how many of them had got calls from Parkash Singh Badal to save his `izzat’ (prestige), and on seeing several hands raised, said it was shameful, but asserted that there would be no forgiveness for the Badals or their henchmen.He reiterated his promise jail the corrupt henchmen and OSDs of the Badals, including Dyal Singh Kolianwal (SGPC member), Satinderjee Singh Mantta and Tejinder Singh Middhukhera for victimizing the people at the behest of their bosses. If Parkash Singh Badal was really unaware of the misdeeds of these men, as he claims to be, then he does not deserve to remain the chief minister, the Punjab Congress chief declared, amid loud cheers. Captain Amarinder also lambasted those involved in the drugs racket in the state, saying he would not spare any of them after coming to power.Earlier, PPCC vice president Sunil Jakhar also appealed to the people to vote for peace and stability, which only the Congress, under Captain Amarinder, could provide to the state.Delhi MLA Colonel Devinder Sehrawat also addressed the crowd, warning them against Kejriwal’s deception and lies. Kejriwal was a businessman and a fraud, whose only aim was to accumulate wealth for himself, said Colonel Sehrawat, adding that the people of Delhi were sick and tired of the AAP government and were regretting having elected Kejriwal to rule the state.